Help You and Your Company! PhoneCrypt solutions provide individuals, small-medium, and large business with the tools and resources to secure 100% of their voice communications ensuring privacy and confidentiality for personal and business needs. PhoneCrypt Mobile is designed for individuals and business professionals. PhoneCrypt Mobile offers true mobile to mobile protection using military-grade encryption ensuring complete privacy. PhoneCrypt PBX is a fully secure, feature rich PBX designed for small to large enterprises. PhoneCrypt PBX is compatible with the PhoneCrypt suite of products for comprehensive security for all voice communications. 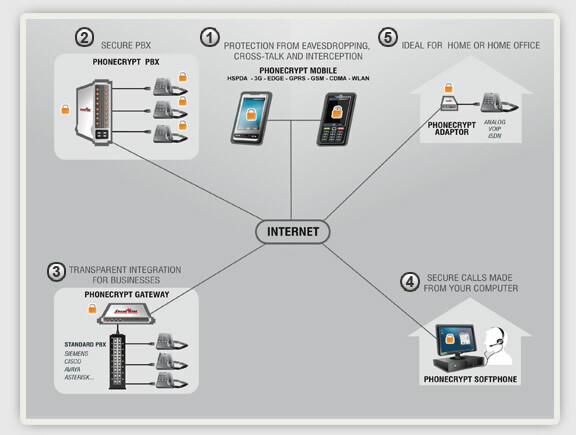 PhoneCrypt Gateway is a versatile fully secure phone gateway designed for use with existing PBX systems. It provides secure calls between gateways or gateway to PhoneCrypt Mobile Phone users. PhoneCrypt Softphone allows ultimate portability and includes the same features and protection found in the hardware offerings. It is designed for mobile professionals, and individuals. PhoneCrypt Solo is designed for mobile professionals, SOHO users, and individuals. It provides complete privacy and integrates with existing land based phones.